There is perhaps no other initiative as potent as a Mortgage Loan Securitization Audit (MLSA) for anyone facing foreclosure. This little known yet common sense remedy can effectively short-circuit the mortgage foreclosure process that is being illegally conducted by many of the banks around the country. The Mortgage Loan Securitization Audit is simply an audit that reveals the current status of the mortgage loan and promissory note. 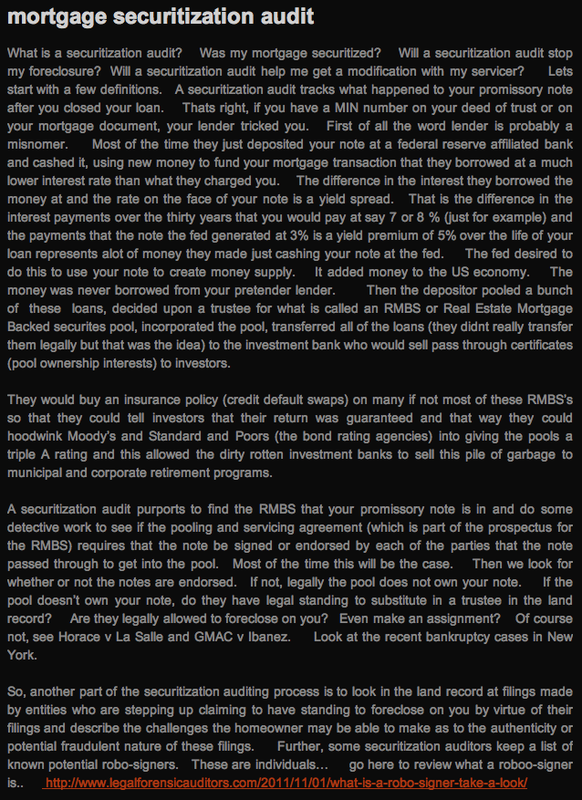 Determining who owns the mortgage, of course, is of paramount importance. Because non-ownership of your mortgage loan is extremely common for the bank which is foreclosing on your home, it can be proven that they are not the actual and legal owner of the mortgage. The MLSA does just that, which then provides substantive remedies to the homeowner that can be quite successful in terminating the banks fraudulent activity. What makes the MLSA so special? The Mortgage Loan Securitization Audit presents a highly authoritative account of the current status of the mortgage loan by accessing official records which indicate the current owner. In the great majority of cases the mortgage loan has been bundled with hundreds or thousands of other mortgages to form securities which have then been sold, and often re-sold. 1) Write a letter to their bank informing them that they have conducted an official MLSA which has unequivocally demonstrated that the bank is no longer the mortgage owner, and therefore has no legal claim to your mortgage payments. 2) File a pro se motion with the appropriate court in the proper jurisdiction which legally puts the mortgage bank on notice that their continued foreclosure process is tantamount to fraud. The process of pursuing your legal and procedural remedies is actually quite simple and can produce very quick results. Please ask yourself why a bank would continue to harass a homeowner with collection activity or foreclosure notices when the official documentation indicates they have no right to your home or payments. There are too many homeowners out there who are completely ignorant of their rights and therefore are much more attractive to the bank than an informed and angry homeowner. Continuing to pursue a fraudulent foreclosure process also exposes the bank to both compensatory and punitive damages in the future, should the case make its way into court. With so many state AGs (attorneys general) making formal announcement about their intentions to pursue these banks for fraudulent practices, many homeowners now also have the power of their state on their side. There are many benefits to conducting a MLSA because the audit trail will almost always surface other information which can be quite powerful in demonstrating either intentional or unintentional fraud. Some of these irregularities can be further explored through the process of another type of audit known as a Forensic Audit. This audit will almost always reveal incorrect dates, improper signatures (read robo-signing), and other false information which undermines the integrity of the mortgage loan documentation. Such error, whether accidental or by design, can establish a legal basis for the propriety of the loan to be seriously questioned in court and other appropriate venues. Exactly what is it and how does it work? Here’s an excellent description of mortgage loan securitization from one of the most authoritative MLSA websites on the internet. 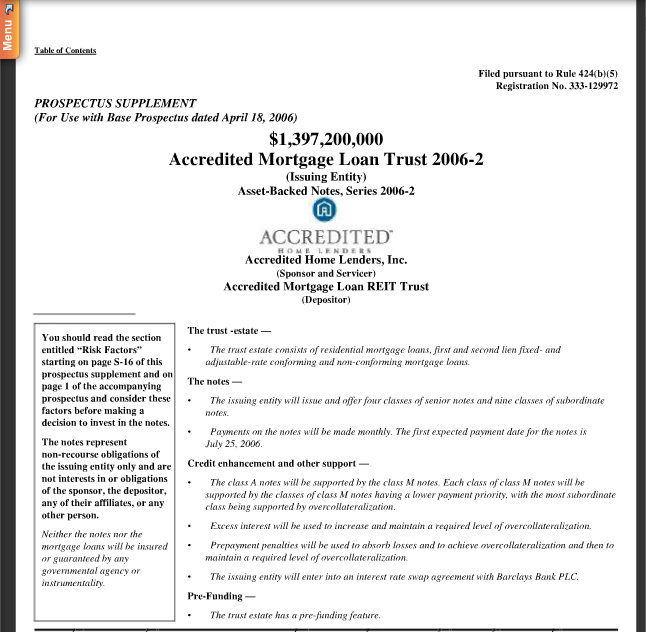 What follows is an example of a Prospectus Supplement for a Mortgage Loan Trust (aka RMBS). This type of official document is produced by the securitization audit and included in the final MLSA report. It serves as just one part of the audit trail which demonstrates that any given mortgage loan has been bundled into a mortgage backed security. Then, subscriber services such as Bloomberg can be accessed by the auditor to locate your particular promissory note. With this kind of proof in hand, and much more audit information provided by the MLSA, a homeowner can proceed to take back his or her home. All that’s required is initiative and resolve to follow through on your stated intentions made to the bank. When sufficient funds are available, and a knowledgeable and experienced attorney can be employed, the appropriate legal motions ought to be instrumental in slowing down, or forever terminating, the mortgage foreclosure process. Each piece of the securitization audit can be highly revealing about the trail of relevant documentation since the origination of the loan. The cogency of many of the official and indisputable documents, which the audit provides, is so compelling that they can be used separately (and individually) for both legal purposes and petitions made directly to the bank. In closing, it is clear that the MLSA lends privileged and valuable information to the process of neutralizing the fraudulent actions of an offending bank. Such remedies can only be pursued by those who have accessed the always telling audit trail of their mortgage loan and note. If the nation’s homeowners currently under threat were aware of the uniquely powerful Mortgage Loan Securitization Audit, the entire mortgage foreclosure landscape would be profoundly altered for years to come. Furthermore, many honest homeowners, who have always played by the rules, would either maintain their rightful ownership or continue to occupy their homes until a fair and equitable resolution was attained. The American people are due nothing less. Whereas the banks are certainly long overdue their comeuppance.